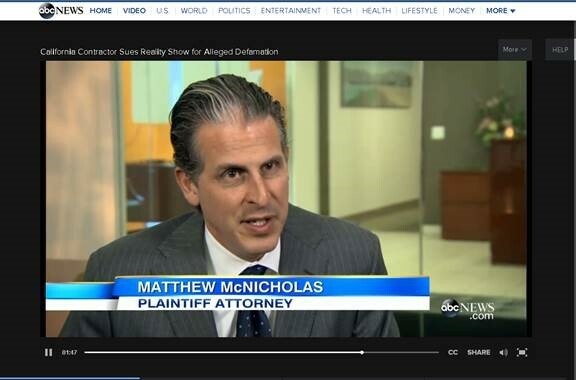 Partner Matthew McNicholas appeared on ABC’s Good Morning America discussing the lawsuit the firm recently filed against Spike TV, on behalf of contractor Jeff Dillman, for allegedly luring him to a fake client’s house in order to ambush Mr. Dillman with camera crews and threaten him that if he did not participate in the show To Catch a Contractor, they would assist the homeowner in taking him to court concerning problems for a remodeling job. As also published by The Hollywood Reporter, Mr. Dillman arrived at a Los Angeles home believing he was going to retrieve a check for contracted work. Instead, he was surprised by the show’s cast and crewmembers, as well as a bouncer blocking the door. Mr. McNicholas’ client was then forced to sign a release, appear on the show and complete the remodeling project, in which he was paid $10,000 for his participation. In the course of the show, they brandished his picture while calling him a criminal. The show aired on Spike TV on March 23, 2014.